Finnish international Daniel O’Shaughnessy rescued a point out of nowhere for visiting Cheltenham with a 30-yard rocket finish ten minutes from time as Mansfield Town were held 1-1 in this afternoon’s opening home League Two fixture. In warm sunshine, the sides had battled out an unexciting first half with Harry Pell missing the best chance for the visitors. But, after Mitch Rose had notched his second goal of the week four minutes into the second-half, the visitors threatened rarely and Mansfield must have thought they were about to win their first home game to build on that opening victory at Newport. But it wasn’t to be as O’Shaughessy smashed in the sort of goal more regularly seen on Match of the Day to spoil Stags’ day. The leveller rocked the Stags who were lucky not to then lose it as the visitors produced a grandstand finish. Mansfield made four changes as Adam Chapman, James Baxendale, CJ Hamilton and Ashley Hemmings dropped to the bench from the side which lost 3-1 at home to Blackburn Rovers in the EFL Cup in midweek. In came Kyle Howkins and George Taft to form a formidable 6ft 5ins central defensive barrier with Kevan Hurst restored to midfield and Danny Rose up front. That meant there was one change from last weekend’s opening day win at Newport with Howkins replacing Chapman. Stags also included new signing, experienced striker Darius Henderson, on the bench for the first time. Danny Rose and Hurst caught the eye as did the two central defenders, who dealt with most of the Robins’ aerial threat with their direct football. Cheltenham, newly promoted as Conference champions, included former Stags defender James Jennings. Cheltenham tried to take the game straight to the Stags, but Mansfield responded with some good pressure that yielded two successive corners. Neither keeper was tested in the early stages and the first real goal attempt came on 18 minutes when Danny Rose flicked a backheader wide from Bennett’s floated ball into the box. But the Robins should have gone ahead on 22 minutes through poor home marking. Waters launched a cross long from the right and Pell was left unmarked to power a header at goal from six yards which Shearer did superbly well to get a hand to and turn round his left hand post. Taft had to block a low effort from Morgan-Smith as the Robins flooded the box when Stags failed to clear the ball with the visitors continuing to edge the possession. On 32 minutes Green battled well for the ball and managed to get away a decent low shot from 20 yards that Griffiths had to dive to his right to turn round the post. A Bennett clearance then sent Danny Rose on a run which saw him control the ball, turn a defender and shoot at the keeper from wide on the right. Shearer was then behind a bundled far post shot from Holman on 43 minutes from a long cross from the left. The game needed a goal – and got it within four minutes of the restart. It was created by Green on the left as he turned superbly between Parslow and Suliman and left them in his wake before squaring an inviting pass to his right to Rose who buried the ball from 12 yards with a crisp low finish. Griffiths was behind a low Green shot from 16 yards soon after. On 61 minutes the visitors made a double change as Cranston and Barthram replaced Waters and Jennings. Green had a shot deflect just over shortly afterwards before Danny Rose was booked for kicking the ball away on 64 minutes. Shearer raced out his box on 68 minutes to clear ahead of Morgan-Smith, but the Robins’ striker flattened him as he did so and the keeper needed treatment but was able to continue. Hemmings came on for the impressive Danny Rose on 69 minutes, then on 73 minutes Mitch Rose fed Green into the right of the box and Griffiths had to beat away his powerful finish. At the other end Bennett put in a superb tackle before Morgan-Smith could get a finish away in a rare Robins threat. With 10 minutes to go, Stags looked to have this game in the bag. But the visitors then levelled with a bolt from the blue. Finnish international O’Shaughnessy let fly from 30 yards with an unstoppable shot that had Shearer clawing fresh air. 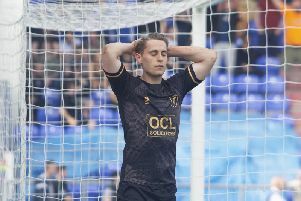 Hurst saw a shot saved before he made way for Henderson’s debut in the penultimate minute. Eight minutes were added on and in the fourth of them, Stags were relieved to see Wright control and fire wide from 18 yards. Wright screwed another late chance wide as the Robins went all out for a winner. Even deeper into added time Hemmings was too high on the turn for Mansfield as the game ended in stalemate. STAGS: Shearer; Bennett, Taft, Howkins, Benning; Collins; Mitch Rose, Clements, Hurst (Henderson 89); Danny Rose (Hemmings 69), Green. Subs not used: Jensen, Chapman, Baxendale, Hamilton, McGuire. CHELTENHAM: Griffiths, Jennings (Cranston 61), Parslow, Pell, Waters (Barthram 61), Wright, Morgan-Smith, Whitehead (Rowe 78), O’Shaughnessy, Suliman, Holman. Subs not used: Kitscha, Hall, Lymn. REFEREE: John Busby of Oxfordshire.